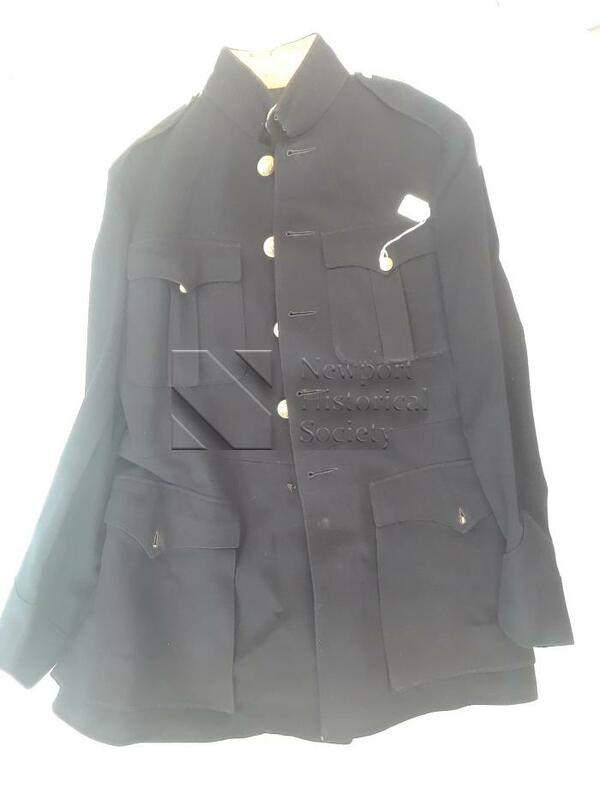 Navy blue U.S. military jacket dated to 1924. Possibly U.S. Marine Corps based on button insignia. 5 large gold buttons down center front. One smaller gold button on each epaulet. 2 large flap front pockets on each breast closed with gold buttons. 2 large flap front pockets on front below waist seam closed with gold buttons. Collar lined with cotton, body lined in gray and black faille, sleeves lined in cream fabric with blue stripes. "X15" stamped in black inside PR sleeve. "Heiberger. 3 Generations. Washington, D.C." label near front placket on PL breast. Label inside welt pocket inside PL breast "F.J. Heiberger & Son. Incorporated. Washington, D.C. Major H.H. Utley, 3 5 67 10-20-24." 2 metal hooks on back act as belt loops.